I know that this has been discussed before but, at the time, it was not possible since ELL was still in beta. Now that it has graduated and has had its first mod elections and everything, it might be time to reconsider the question. If we do choose to have one, we should also set up some clear guidelines on what kind of questions we will be migrating. ELL is not and should not become the dumping ground of bad ELU questions. The golden rule will still apply: don't migrate crap. However, we do receive a fair amount of perfectly good questions that are simply too basic for this site but would be perfect for ELL. Questions that are clear and well formulated but which, while obvious to any native speaker, are understandably confusing for someone learning the language. Such questions really belong on ELL. So, should we have a migration path opened to ELL? I believe this would make a lot of sense and is the single most useful migration path we could have here. As of 22 September 2015, we do have this capability, courtesy of The Powers Who Do That Sort Of Thing. As WendiKidd has implied in her answer, there are risks and potential difficulties. Use with care! TLDR: I don’t have a lot of confidence that this will work out, but unless we make the attempt we won’t have the data to support that hunch. Plus until we do so, people will keep asking for it. But before we can, we would have to have some other stuff in place first. That tell us that right now, almost one in every six questions currently migrated to ELL from ELU by moderators is being rejected. Again, those are all moderator migrations because no one has a default off-topic migration path to ELU right now. There have historically been others, but they were removed because people were migrating too much crap. Which is what I worry will happen with us. I once took a broad look at the ELU questions that had received comments to the effect that the post would do better on ELL. My conclusion at that time was that if all those had turned into migrations, there would have been an overwhelmingly high rejection rate: not just a simple majority but maybe 80 or 90 percent. It’s true that these were just comments not actual migration votes by 3k users with the close-vote privilege, so we don’t know what the votes might have been. And migration does require a super-majority of at least four out of five votes. A lot of questions closed for General Reference or Proofreading on ELU that people say should be on ELL should not be, because they would just get closed for Dictionary or Proofreading there, too. That shows that people forget not to migrate crap, and are just looking for a dumping ground. That is a real problem. 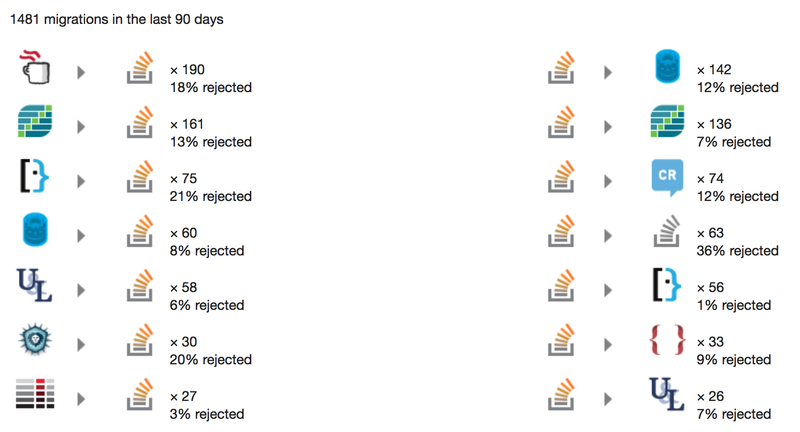 We get plenty of migration rejections even now with only migrator-migrations. It could only get worse. My gut feeling is that having CV privileges on ELU may not be a good enough qualification for making someone good at judging whether a question is a good fit for ELL. What might work, but which is too hard because there is no code to support it right now, is for there to be a reputation requirement for both source and target site for migrations. However, the question asking for that, Require minimum reputation on the target site for migration, has been status-declined on MSE. So unless and until this feature were reconsidered, it wouldn’t be possible to have a double reputation requirement. However, if it were, I wouldn’t mind starting with a requirement of Trusted User on both sites, and then consider halving it if that works out ok. Yes, I know that’s very high. But I am afraid that at this point I quite honestly don’t have enough confidence that ELU-to-ELL migrations will be done well enough not to provoke bad feelings and high rejection rates. Based on the other ELU meta posts I linked to as Related in my comment on Rob’s question, I predict that the Community will come down firmly in favor of there being such a path. If this is what the Community truly wants, or perhaps the Communities, then we could try it for a while. And it doesn’t, then we’d have concrete data to that effect. Even though this is my hunch, we don’t actually have that data yet, and can’t get it in any other way. It would cause no great lasting harm to give it a go for some initial trial period, whatever is long enough to acquire that data. It’s going to take a lot user education first for there to be any hope of it working out well. We have over 400 users with vote-to-close privileges on ELU. Therefore if we were to try this, we should absolutely have a FAQ here on Meta with concrete guidelines about just what should and should not be migrated to ELL, along with plenty of examples. As a regular user of ELL I would request that migrations to ELL continue to be handled by the moderators of ELU. SE is, in general, very reluctant to create migration paths because they tend to be abused. Truth is, migrations are not often particularly necessary. It's usually just as easy for the asker to re-post his question on a new site as it is for 5 close-voters or a moderator to migrate. There are better tools available for those rare occasions when a new site is actually carve off of an existing one, and that's primarily what the current system was designed to handle anyway! The reality is, even with only ELU moderators migrating questions, the quality of the questions being migrated is occasionally extremely poor... meaning that the question is not a "good question" by the standards of any SE site, regardless of it being on-topic or not. I did bring this up in the ELU chat recently and it seems that the quality of migrated questions has improved to some degree since then, which I sincerely appreciate. I don't feel there's enough quality content to warrant opening the possible floodgates between the two sites (and, yes, this means I also think ELL should not have a migration path to ELU). In fact, the golden rule of migration is "don't migrate crap". When a question is migrated (and deleted on the original site) and then the target site rejects the migration by putting the question "on hold", the question enters a limbo state where it can never be recovered. This is a disservice to the person who asks the question because they have no way to improve their question. As a general rule, if the form of the question wouldn't be acceptable on your site (regardless of topic), then dropping it onto someone else's (where the author may not even have an account) is rude: it's probably not gonna get better. When in doubt, drop in a link to movies.stackexchange.com/tour and suggest that the asker read it and re-post. Always acceptable to NOT migrate. If you're gonna migrate or ask someone else to do so, try to make sure the asker looks good when his question appears on the new site. Failing to do this creates a bad experience for everyone involved. ELU should close vote poor quality questions and encourage the asker to re-ask the question on ELL rather than migrating it. Maybe. I think many questions asked here should be asked there instead. However, the user base here doesn't fully overlap with the user base there and it can be difficult to judge if a question should be migrated. In my ideal world, users with high-rep accounts on both sites would be the ones who perform the migration. As a moderator on ELL, I'm going to try and explain why I think this is a Well Intentioned but Very Bad Idea. I get that the request for an ELU->ELL migration path has come up in the past, an gotten support on your end, I'm not sure it's the best for our (or either) community. Our users have already pretty summarily rejected the reverse ELL->ELU path. Personally I think the same logic applies to paths in both directions... And I am pretty much positive that we would have a repeat of SO->Programmers if an ELU->ELL path opened up. So, while I understand the spirit behind the request, I think it would just end up with frustration on all sides and more work for both mod teams. The questions you want to have migrated to ELL are already being migrated by the mod team. The ones you don't, still won't. I don't think the need is there, I think it would be abused, and I don't believe our community would go for it. But you're welcome to open a meta post over on ELL and ask. I'm one of the more active users in moderation over on ELL, so you can imagine I viewed this proposal with a certain degree of concern, and in fact I voiced caution on ELL's matching meta post. Keep up the good work, stay selective, and know that you have our thanks for doing a much better job than we feared, and perhaps even a better job than we hoped. Since this was originally posted, the situation has not stayed so rosy; at present (Jan 2016), the rejection rate is 13%, and most of that is in the last month or so. Could use some more caution, it seems. There's already a migration path: The road to ELL is paved with good intentions. Not the answer you're looking for? 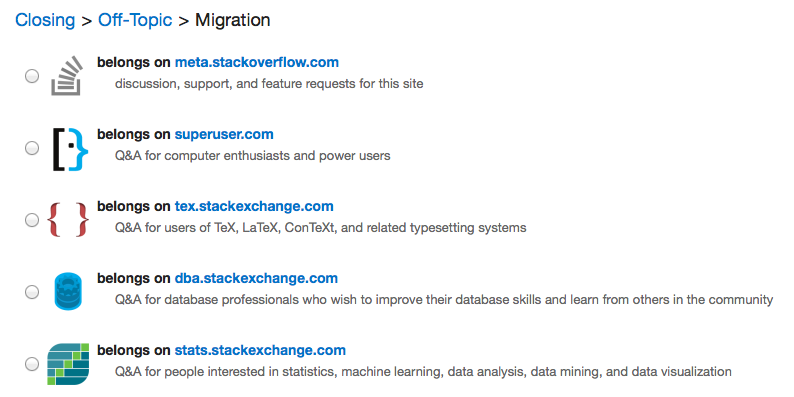 Browse other questions tagged discussion status-completed migration ell .